Introducing recharging moments in salon and at home with the latest sensory technology in professional hair colour and care. The new 31-piece INVIGO range creates recharging moments with high-performance care treats for all hair needs. Featuring advanced blends, technology, new ingredients and vitamins – encased in fragrances that enlighten the senses. Modern life no longer fits into the 9-5. With busy portfolio careers and hectic home lives, women find it increasingly hard to find any time to slow down, breathe and recharge both physically and emotionally. With rest and relaxation at the bottom of the to-do list, it is no wonder that this is reflected in our hair, which is often neglected as we struggle to get to that salon appointment, or only have time for a super quick cut and blow dry. With this in mind, Wella Professionals introduces INVIGO, a new brand and high-performance care line designed to recharge your hair quickly and effectively whilst also answering all your hair needs. Developed using INVIGO-Blends - a trio of NEW Advanced Technology, Super Ingredients and Vitamins - INVIGO instantly invigorates both your hair and well-being. In just a few minutes hair is instantly transformed from lack-lustre to full of life. Each INVIGO care treatment contains highly concentrated boosters, a reviving massage and product enhancers that instantly revive hair, leaving it full of life, looking and feeling healthy. 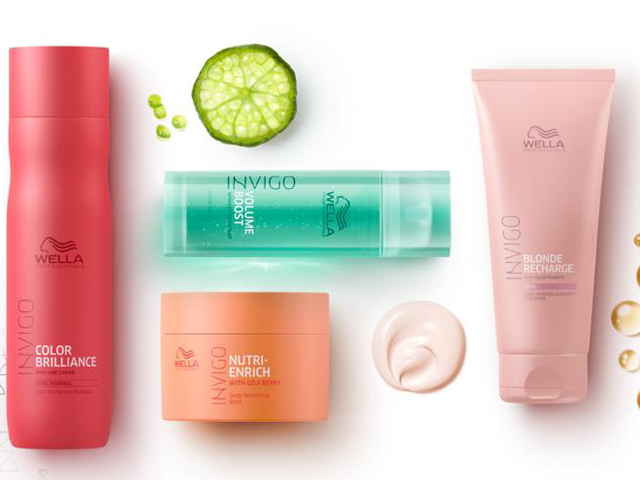 The complete INVIGO care line: Blonde Recharge, Color Recharge, Color Brilliance, Nutri-enrich, Volume Boost and Balance have been developed to work in conjunction with 3 INVIGO exclusive in-salon treatments: BRILLIANCE BOOSTER, NUTRI BOOSTER AND VOLUME BOOSTER. These new treatments turn basic care services into the quick, easy, personalised and enjoyable moments that clients look for in a salon appointment and from their stylist. High Performance INVIGO-BlendsTM – new ingredients, advanced technology and vitamins all carefully selected for each line to offer high performance care solutions that answer all hair needs. Starting with a consultation in the salon with a stylist, the correct blend is tailored to the needs of the hair. This technology features across the entire INVIGO line-up.